BHP has awarded Literacy Action of Central Arkansas a $6,700 donation to support literacy programming in Faulkner County. Aaran Mattson, Literacy Action’s Faulkner County program coordinator, and her student use the program’s current equipment to work on literacy. The program plans to replace the equipment, which officials said was from 2006, with new hardware and software thanks to a $6,700 donation from BHP. This local donation is part of more than $18,000 awarded to Faulkner, Conway, Van Buren and White counties, where BHP has operations. “Literacy Action is incredibly grateful for this support from BHP,” Sara Drew, Literacy Action executive director, said. Funding from the BHP donation will allow Literacy Action to purchase much needed curriculum, and new hardware and software. 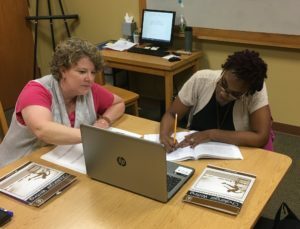 Funding from BHP will allow Literacy Action to serve more students in Faulkner County, both by providing new curriculum for both students and tutors, but also through new donor, student and volunteer database software, and new computers and other hardware. Approximately 16 percent of adults in Faulkner and surrounding counties are functionally illiterate. This support from BHP will benefit all adults in Faulkner County that want to improve their literacy skills, Drew said. This article was reposted from Conway’s Log Cabin Democrat. Check out their website for more local Conway news!